It is very important to place kite in field just before crop is attractive to birds. Bird deterrents are usually effective for a limited time. Birds habituate (get used to) all sorts of annoying things. As they become aware that there is no real danger, they will stop responding to flashes reflective material, noise of cannons, distress calls of birds and kites. 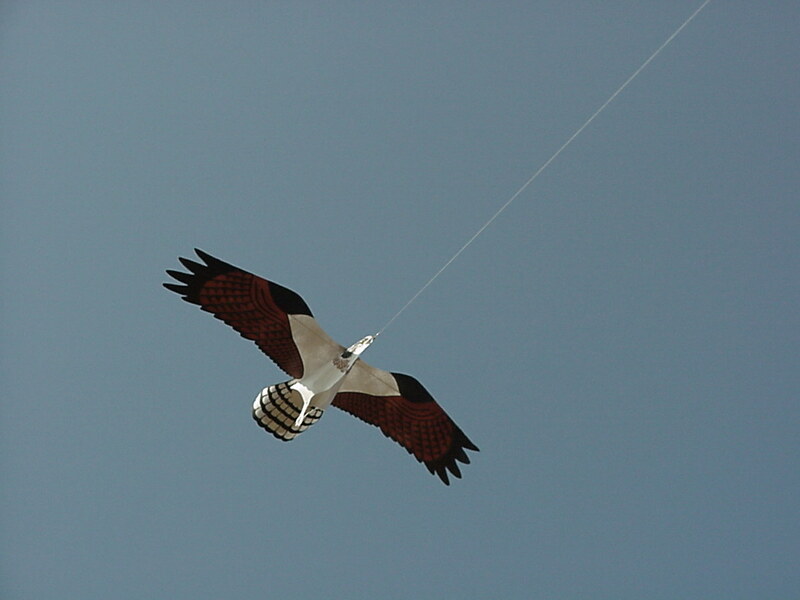 This kite has realistic movement so it should take longer for the birds to figure out that it wont harm them. What birds are attacking your crop? A friend noticed that black birds pick the caterpillars, pest bugs and a few earthworms from his strawberry beds. They dont damage the berries and help with his pest control. But finches and meadow larks peck at the seeds on the strawberries and the fruit rots. He sees his neighbor in his strawberry field shooting blackbirds. The first rule of IPM is identify your pest. People have used reflective ribbons, noisemakers, sprinklers with motion detectors, and model airplanes (contract with local RC club) to repel pest birds. Let us know what works for you. Dispenser for eggs, mites, etc. to modify your Maruyama biocontrol applicator. Smucker no longer manufactures Bio-Sprayers, but a few are still available. 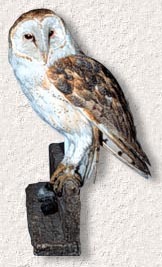 The Barn Owl (Tyto alba) is distributed world-wide, absent from only the cold Latitudes. While the barn owl is found all over the US, its numbers are particularly high in California and the Southwest. Farmers and ranchers are increasingly attracted to the barn owl's ability to control rodents better than traps, poison, or cats and at very little cost. Barn owls in favorable habitats produce large broods once or twice a year. Each young owl as it nears maturity will eat the equivalent of a dozen mice per night if such prey is available. Adult barn owls kill and consume the equivalent of one large rat or gopher per night. The Owl Rehabilitation Research Foundation, Ontario, Canada, reports that barn owls consume twice as much food for their weight as other owls. A family of barn owls will eat about 3,000 rodents a year, with about 70% gophers. Refined wing and feather structures make it silent in flight, bringing its well- deserved nickname "the cat with wings." Both prey base (rodents) and suitable nesting sites limit the number of barn owls in an area. Owl nest boxes can be within 30 feet of each other. In the West, barn owls nest in natural tree cavities and buildings, as well as in cavities in cliffs and cut banks, stacked hay bales, and in palm trees. Use of these sites often leads to nesting failure such as when bales are shifted or the young outgrows the nest at the base of palm fronds. They are accustomed to humans and will tolerate a moderate level of activity as long as they are not threatened. Several nest box designs can be made from inexpensive or recycled materials. In California it is best to install nest boxes in December, but since they have several broods a year, anytime early in the year may bring an occupant. Owls seek their prey either from a perched position or on the wing. Perches in areas with high rodent populations aid the owls search. If you have bats in your neighborhood, with the right exposure and a suitable bat house, you can get a colony of bats to move in. A small single chamber house will attract a small group of bachelors to roost for the day. Larger multi chamber houses will attract colonies that will produce young. Nursery colonies look for open water (a pool will do), a clear zone below for swooping in and out, and a good supply of night flying insects. If you dont have the space or water for the nursery colony  go for the bachelor pad. We offer bat houses that are approved by Bat Conservation International (BCI) and the Bat House Builders Handbook is based on BCIs research. There are about 15 species of bats that you may attract to a bat house in the US. The little brown bat for example will eat its weight in flying insects every night, or about 600 mosquitoes an hour. A colony of big brown bats will protect local farmers from up to 18 million rootworms in a summer. Moths that attack fruit, such as the codling moth, peach twig borer, and omnivorous leaf roller, are night flying insects that bats eat like we do popcorn. Nearly 40% of American bat species are in severe decline or already listed as endangered. Losses are occurring at an alarming rate worldwide. Decreasing toxic pesticides, using biocontrol, and providing habitat for these amazing flying mammals will help bring them back. They in turn will help you with your pest control.